One the primary design requirements for the rugged USB drive is a high pressure rating: at least 1000 psi if not considerably higher. In order to test our design to see if it actually works we'll need a pressure testing rig. Creating a completely custom pressure testing rig is not necessarily difficult but even a small one would end up being $1000s in design and manufacturing costs. It would be nice to be able to create a very simple rig consisting of cheaper off-the-shelf components. Looking at industrial product sites like McMaster or Acklands-Grainger we find that the highest pressure rating easily obtainable are 3000 psi which should be more than sufficient for our purposes and are relatively cheap. For now the desired volume of the rig can be kept low: just enough for 1 or 2 USB cases at a time. For pressurization of the vessel normally some sort of pump would be used but in order to keep the design simple and costs as low as possible we'll just use a piston which can be pushed into the vessel. Since the vessel volume is small we can use a rod with a small cross-section (0.5in diameter) and thus keep the force required to push it in low (< 100 kgs) as well as the distance it needs to be pushed in (about 2in for 3000psi for this vessel). 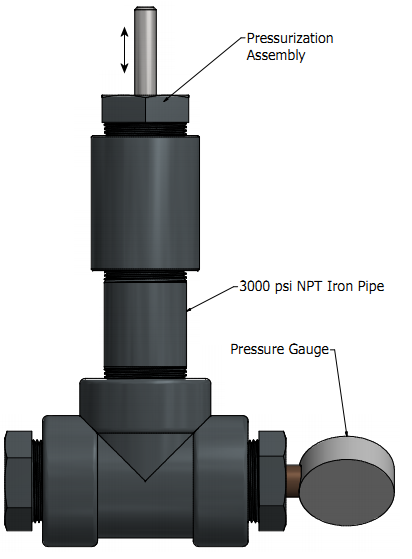 The overall design of the pressure vessel can be seen below using off-the-shelf 2in NPT iron pipe fittings rated at 3000 psi. Its overall height is just under 1 ft and its total weight is around 35 lbs due to the heavy duty iron fittings. We some effort we could probably fit 4-6 USB cases inside it at a time. The details for the pressurization lid and rod can be seen below. We use two hydraulic o-ring lip seals which are rated to 3000 psi each and result in no leakage when the rod is pushed in or out. Add object to be tested. Replace cap ensuring pressurization rod is extended. 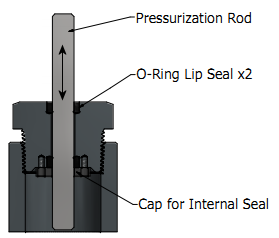 Push the pressurization rod into the vessel to achieve the desired pressure. I created a simple clamp using two threaded rods and some Aluminum plates which cannot slip off the rod. Wait for a set period of time, typically one hour. De-pressurize vessel, remove object and check for failures. Ball or gate valve to more easily put objects inside the vessel (costly for a 3000 psi version). Larger volume for testing more USB drives at once. This may also require the diameter of the pressurization rod to be increased. Change to a hand pump for pressurization. This would be required if the vessel volume is considerably increased. Now that we've got a pressure test rig we can get on to creating and testing some VIUD prototypes!